Mariko, Tokyo, the Science of Japanese Dermatology is written on the attractive cover of their brochures. Underneath is “HINDI MAHAL MAGPAGANDA” which is indeed very attractive to the eyes of budget conscious men and women who wish to maintain their good looks, and have some minor weight problems. I checked out the place upon hearing about it from a friend and was very satisfied with the service I got. And most importantly, the PRICE IS RIGHT! ESMI, the aesthetician assigned to me is a registered nurse. She convinced me to have a Triple –C Gluta Facial with Vacuum and Laser accompanied by a Jet peel which cost me only PHP 350. 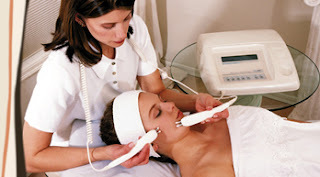 A diamond peel cost only Php 149.00. I looked over their brochure and compared prices with other Beauty Clinics and realized Mariko‘s prices are lower. Their Laser hair removal in the armpit cost PHP 450, Face PHP 999, Brazilian PHP 2550. I tried their BIO SCULPT- which is a painless way to remove fat from stubborn areas like the stomach, hips, thighs, arms etc. They placed self adhesive electrode pads on the areas I selected. I felt no discomfort. The electro stimulation supposedly breaks down the triglycerides in the fat cells into tiny free fatty acids, which the lymph system is able to remove from the body. I noticed a minor improvement in the areas I selected. I will do it a couple more times until I am satisfied with the results I am after. This cost me only PHP 399 per treatment. Mandaluyong Circle near the City Hall-tel 477-5736. Esmi, my aesthetician who did a triple Gluta with jet peel on me, among other treatments. Facial with jet peel did my skin a lot of good! Bio Sculpt-Painless and effective way to lose inches.